Statement: Why we need an inquiry into violence against people with disabilities. From Gender Integration to Gender Transformation Forum. Get involved, become a member! The ABC Four Corners program â€œIn Our Careâ€ has generated significant media and community response. Women with Disabilities Victoria takes the following position regarding violence against women with disabilities in disability services. Women with disabilities are strong. Much of the conversation about abuse of women with disabilities has centred on our vulnerability. This so called â€˜vulnerabilityâ€™ is not a characteristic of being a woman with a disability. To the contrary, Jules Anderson and Milly Parker demonstrated their strength and resilience when speaking about their experiences leading up to and during their interviews with 4 Corners. Our 'vulnerability' comes from broader community attitudes that degrade people with disabilities and degrade women. Gender inequality is reflected in sexist jokes and sexual harassment, as well as the appallingly low levels of women in senior management. Gender inequality has been found to be the fundamental driver of violence against women. Discrimination against people with disabilities is reflected in low levels of employment, bullying at school, ableist jokes and stereotypical representations in the media. This discrimination leaves us seriously disadvantaged socially, politically and economically. Gender-based violence and disability-based violence combine to significantly increase the risk of perpetrators targeting women with disabilities. These social conditions allow perpetrators to use violence against women disabilities with impunity. The issues raised in the Fairfax/ABC investigation highlight the prevalence of violence in the lives of women with disabilities. Our research project, Voices Against Violence, indicates that perpetrators believe they can get away with it, and women fear they won't be believed if they report assault. Sadly, in many instances, both of these assumptions are correct. Prevention of violence is needed. Women with Disabilities Victoria has focused on approaches to prevention that address both gender inequality and disability discrimination. Women with Disabilities Victoriaâ€™s pilot violence prevention training program involves women with disabilities co-facilitating groups of disability service staff. The women work alongside trainers with experience in violence prevention and response. A strength of this training is that it builds relationships between disability services and womenâ€™s services who have expertise in responding to violence. This is exactly what is needed across services and government departments. Only with leadership in this direction can we really address violence against women with disabilities. It would be a mistake to think we can address this issue by investigating the events of one organization. Violence against women with disabilities is present across disability, aged care, mental health and other health services. This issue must be recognised as a major community concern, requiring leadership and coordination by government. As Senator Rachel Siewart stated in the Australian parliament yesterday, to think that the issues are only limited to Victoria would be a grave mistake. Women with Disabilities Victoria supports the calls for inquiries into violence in settings where disability services are delivered, at both a state and national level. We are heartened by the responses of all Victorian political parties. We endorse the call by Women With Disabilities Australia and the former Disability Discrimination Commissioner, Graeme Innes, that the Australian Government undertake an inquiry. This inquiry is of critical importance to ensure our right to safety in the roll out of the National Disability Insurance Scheme. The second annual Brenda Gabe Leadership Award recently awarded to Jody Barney, as part of an awards ceremony attended by over 140 members and other community representatives at our Annual General Meeting. The Brenda Gabe Leadership Award recognises and rewards a woman living with a disability, who has made a significant contribution to improving the status of women with disabilities in Victoria. Women with Disabilities Victoriaâ€™s Executive Director Keran Howe noted â€œAs women with disabilities we face many issues in addressing disadvantage.The Brenda Gabe Award highlights women's work in challenging the disadvantage women with disabilities face. It is also wonderful to see the impact that being nominated for the award has for all of the women involved. Jody has made enduring and valuable contributions as an Australian Indigenous leader, as a woman, and as an advocate for people of all abilities. She is the first Deaf Aboriginal woman to present at local, state, national and international levels on the empowerment of Aboriginal people with disabilities. She was actively involved in the National Congress process, the First Peopleâ€™s Disability Network (Australia) and the International Deaf Native Gathering. Jody models leadership to others in the aboriginal and ghe disability communities. She demonstrates a holistic approach to strengthening leadership and self-determination, making her the perfect Brenda Gabe Leadership Award recipient. â€œThe Brenda Gabe award is significant because it recognises and celebrates women with disabilities who give so much, often so quietly, to ensure a better life for women with disabilities.â€-Jane Oldfield, Partnership and Leadership Development Officer, Women with Disabilities Victoria. 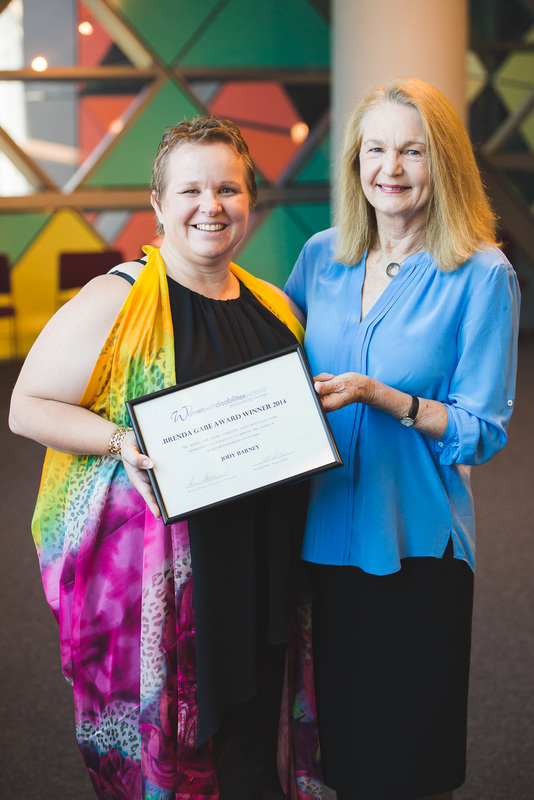 This award was created to honour Brenda Gabe, a much loved and respected member of Women with Disabilities Victoria and a strong and committed disability advocate. Brenda represented Women with Disabilities Victoria on various committees, forums and conferences. She played a leading role in disability related campaigns, including making both hosing and public transport more accessible, and preventing violence against women with disabilities. The winner of the award receives $2000 towards a capacity building project or professional development. WDV would like to congratulate all nominees for the Brenda Gabe Leadership award and to thank those who nominated them. This award would not have been possible without the generous support of Dr Helen Sykes the Director of Future Leaders. Sonia Marcon is returning to the professional world after her diagnosis of multiple sclerosis thirteen years ago. She volunteers for a number of not-for-profit organisations including Women with Disabilities Victoria. Georgia Kavanagh-Dando is a student, but not for too much longer as she is just about to finish her degree. She has over 800 hours of voluntary work experience under her belt, including the work she has done with Women with Disabilities Victoria. "We were teamed up because our degrees were similar. From our studies we share a love of communications and politics. Over the last few months we have been working on a Social Media Policy for WDV, which will soon be rolled out to the staff. We were both able to bring different knowledge to the project. We have different minds, so we were able to come up with an end product that showed our different experiences. Because we were both working towards the same end goal, we were able to work without having to compete with each other, we were both on the same level. Yes, weâ€™ve learnt a lot about writing a policy and working in the industry, but we've also learnt a lot about collaboration. We were given responsibility, which meant that we not only felt respected in a professional sense, but that we was given the opportunity to show respect also. One of the biggest skills we've learnt is to be reliable and that we can rely on the organisation too. We would like to thank WDV for giving us this great opportunity." In July 2014 WDV wrote a submission to an Australian Senate Committee Inquiry into Domestic Violence. Our written submission makes 19 recommendations for the Australian government to drive change regarding violence against women with disabilities. The Senate Committee undertaking the Inquiry (the Finance and Public Administration Committee) invited WDV to an inquiry hearing held on November 5 2014. We were pleased to be asked to present to the committee alongside one of our Voices Against Violence Research partners, Office of the Public Advocate, as we share similar goals for work to be done. These include the development of national disability standards and disability workforce training that includes responding to violence against women with disabilities. We made short presentations and senators asked WDV and OPA questions related to the recommendations in our written submissions. The hearing transcript will be available via Hansard â€“ when the transcript is available we will include it in the e news. The No More Deaths campaign group has teamed up with Fair Agenda to develop an online petition based on the 25 key campaign asks in the lead up to the 29 November election. Please show your support by declaring you stand with the family violence workers across Victoria committing to the No More Deaths Allianceâ€™s priority actions, by signing the Fair Agenda petition. What is Domestic Violence? Are you safe at home? Want to rate your relationship? Are you concerned about a friend or relative? LiveFree is designed to increase your understanding of domestic violence and provide information about warning signs and how to get help. Please find below a link to an iphone app developed by Doncare in partnership with Doncaster Rotary and Vic Police, this app contains very good information for women living with or experiencing domestic violence. Please share with all of the women you know. Hollaback! Melbourne is the local chapter of a global movement working to end street harassment. Hollaback is powered by a network of local activists around the world. What are we doing? We are launching online surveys in countries on six continents, translated into multiple languages. Links to these surveys will be tweeted, blogged, facebookâ€™ed and emailed worldwide with the hope of gathering data on street harassment that can be used to better understand its impacts in an international context. Links specific to Melbourne (and Australia) can be found below. What can you do to help? Complete a survey! Complete it and send the link on to others who may or may not be familiar with the movement. The more respondents the better! What can you expect? The survey asks about demographics, experiences with harassment, reactions to it, and other questions. It is completely anonymous. Summary reports and press releases can be expected early in 2015. What if Iâ€™m not from Melbourne? If youâ€™re not from Melbourne you can still complete the survey, as itâ€™s important for us to get data from as many people as possible and just include where youâ€™re from when youâ€™re asked. WDV has been contacted by a family wishing to donate their late mother's electric wheelchair to a woman who needs one. It is a HEARTWAY dual control Power Electric wheelchair with tilt seating and power elevating leg rests. "We would be really very happy if someone could make use of it as at the moment it is just sitting in our house gathering dust! We keep it charged and move it now and then! It was purchased new in about March so still under warranty with the company mobility aids, so possibly they would check it out when someone wants it. We would like to just give it to anyone who really requires one and cannot afford it." If you (or someone you know) are interested in finding out more about the wheelchair, please email wdv@wdv.org.au and we can put you in touch with the family who are donating it. Deaf Australia, the Deafness Forum of Australia, the Australian Communications Consumer Action Network (ACCAN), the Australian Federation of Disability Organisations (AFDO) and Media Access Australia (MAA) have condemned the proposed changes to the Broadcasting Services Act, arguing that there had been no proper public consultation about them, and they would reduce consumer protection. Removing compliance reporting for free-to-air television so they no longer have to publicly report that they are meeting the captioning regulations. More complex calculations for determining how much captioning sports channels should provide. Watering down measurement and regulation of caption quality. The Broadcasting and Other Legislation Amendment (Deregulation) Bill 2014 was read into the House of Representatives on 22 October 2014. It has now been referred to the Senate Communications and Environment Committee, which will report on it in February 2015. A petition has been started on change.org, addressed to the Minister for Communications, Malcolm Turnbull, to keep mandatory reporting on closed captioning for free-to-air broadcasters. Media Access Australia suggests that caption users who are concerned about the proposed changes should contact their local MPs. Scope is inviting adults with disabilities to participate in research. The research aims to test surveys that measure how included adults with disabilities feel in the community, and how various services improve their lives. Your anonymous response will help us test whether the surveys work well. Come and learn about the products and services that are available from Scopeâ€™s Communication & Inclusion Resource Centre. You will be able to play with a large range of non-electronic communication aids and ask our experienced staff any questions you have about our services - including the popular Non-electronic Communication Aid Scheme (NECAS) and our very first app Tools 2 Talk. Call us to select a suitable date and time, and theyâ€™ll come to you! The session will be 1.5 hours. Contact Scopeâ€™s Communication & Inclusion Resource Centre for further information and to book your information session now! Tools 2 Talk communication aid app is now LIVE! Scope has developed a communication aid template app for the iPad. This app consists of a range of communication aid templates just waiting to be built. The content of each aid can be individualised using both the SymbolStix and COMPIC image libraries included with the app, or photos directly from your iPad camera roll. These aids can be used on the iPad without voice output and as printed resources. People with little or no speech, or who have speech that is difficult to understand, will find these communication aids useful. Visual supports which help a person to understand his/her environment, remember events or assist with the completion of tasks such as calendars and whoâ€™s here today boards. The app allows you to personalize the communication aid templates which feature over 13,000 symbols to access, and import photos from your camera roll. With the in- built help section to the app, you will find this app easy to use and navigate. This event will feature the Australian book launch of Making it Better: Gender Transformative Health Promotion, a fantastic new resource, developed by the British Columbia Centre of Excellence in Womenâ€™s Health. Women's Health Victoria is proud to have partnered with the Centre in the development of this ground breaking tool. Other features of the forum include presentations from Lorraine Greaves, Ann Pederson and Nancy Poole, international experts in the field and authors of â€˜Making it Betterâ€™. Presenters will explore gendered health promotional principles and offer practical tools and evidence-based strategies for transformative practice, offering a fresh approach for policy makers, researchers and health promotion practitioners. Refreshments and networking opportunities will be available at the conclusion of the Forum. A film about WDV Member Amanda will be screening at Fed Square as part of the Other Film Festival. The Villa Maria and Transurban Out & About Family Fun Day is an all abilities, all ages event on Sunday, November 30 at Albert Park Lake and gives everyone the opportunity to experience life as it should be â€“ 100 per cent accessible. Come and join in the all accessible fun! Special guests include Out & About Ambassador and comedian Tim Ferguson, one of Australiaâ€™s most loved singer/songwriters Kate Ceberano, and Australian Paralympians. The jam-packed day runs from 10am-3pm and includes free modified sports and activities at the Melbourne Sports and Aquatic Centre, an all-abilities walk around Albert Park Lake and a pop-up sensory garden designed and built by Swinburne University students. Download the free Out & About app Villa Mariaâ€™s award-winning Out & About â€“ Accessing your community app is now available to download on Android. The free app helps people find accessible venues and events across Melbourne with the touch of a finger. Itâ€™s designed to assist people with a disability or mobility limitation, their families and carers, to better access their community and plan a great day out. What does it mean to become a member of WDV? Become involved in one of our leadership programs designed to promote sharing leadership skills. Sharing information with other women through our e-newsletter and email bulletins. Representing women with disabilities on Boards, Committees and forums. These opportunities are circulated to members who have an interest in a particular field. Contributing to government submissions, representations to government and organisations and presentation of conference papers. Full membership is available to women with disabilities in Victoria. Full membership is free. Associate membership is open to individuals and/or organisations supportive of the aims of Women with Disabilities Victoria and enables exchange of knowledge, and participation with Women with Disabilities Victoria and its members. Associate membership is $20 for individuals and $50 for organisations (this includes GST). The purpose of this e-News is to inform our members, staff and associates about opportunities to advance Women with Disabilities Victoriaâ€™s goals. Women with Disabilities Victoria works to address priority issues for women with disabilities in Victoria. These issues include violence; access to health services; reproductive rights and parenting, and; access to employment. We welcome and encourage your feedback and contributions to simone.flanagan@wdv.org.au. Copyright Â© 2014 Women with Disabilities Victoria, All rights reserved.